The Vilayet of Syria (Ottoman Turkish: ولايت سوريه‎, translit. Vilâyet-i Suriye), also known as Vilayet of Damascus, was a first-level administrative division (vilayet) of the Ottoman Empire. At the beginning of the 20th century, it reportedly had an area of 62,180 square kilometres (24,009 sq mi), while the preliminary results of the first Ottoman census of 1885 (published in 1908) gave the population as 1,000,000. The accuracy of the population figures ranges from "approximate" to "merely conjectural" depending on the region from which they were gathered. In 1864, the "Vilayet Law" was promulgated. The new provincial law was implemented in Damascus in 1865, and the reformed province was named Suriyya/Suriye, reflecting a growing historical consciousness among the local intellectuals. Jerusalem was separated from the rest of the province, and made into an independent sanjak of Jerusalem that reported directly to Istanbul, rather than Damascus. Mount Lebanon had been similarly made into a self-governing mutesarrifate in 1864. In 1872, a new administrative region was created, with its center in Ma'an, but the costs for the new administrative unit far outweighed the revenues, and it was closed the following year. In 1884, the governor of Damascus made a proposal to establish a new vilayet of southern Syria, though nothing came out of this. In 1888, a vilayet of Beirut was formed from the vilayet of Syria. In May 1892, another proposal was made for a regional government centered in Ma'an, which was approved in August. In mid-1895, the centre of this mutasarrifiyya was moved to Karak (Mutasarrifate of Karak), marking the southernmost extent of Ottoman rule in the vilayet of Syria. As of 1897, the Vilayet Syria was divided into four sanjaks: Damascus, Hama, Hauran and Karak. The Vilayet's capital was Damascus. ^ Mutlu, Servet. "Late Ottoman population and its ethnic distribution" (PDF). pp. 29–31. Corrected population for Mortality Level=8. ^ Chisholm, Hugh, ed. (1911). "Palestine" . Encyclopædia Britannica (11th ed.). Cambridge University Press. ^ Salname-yi Vilâyet-i Suriye ("Yearbook of the Vilayet of Syria"), Syria vilâyet matbaası, Suriye [Syria], 1300 . in the website of Hathi Trust Digital Libray. ^ a b c d Rogan, Eugene L. (2002-04-11). Frontiers of the State in the Late Ottoman Empire: Transjordan, 1850–1921. Cambridge University Press. pp. 52–55. ISBN 978-0-521-89223-0. Retrieved 2013-06-10. ^ Fawaz, Leila Tarazi. An Occasion for War: Civil Conflict in Lebanon and Damascus in 1860. Al-Karak, also known as just Karak or Kerak, is a city in Jordan known for its Crusader castle, the Kerak Castle. The castle is one of the three largest castles in the region, the other two being in Syria. Al-Karak is the capital city of the Karak Governorate. Ma'an is a city in southern Jordan, 218 kilometres (135 mi) southwest of the capital Amman. It serves as the capital of the Ma'an Governorate. Its population is approximately 41,055 in 2015. Civilizations with the name of Ma'an have existed at least since the Nabatean period—the modern city is just northwest of the ancient town. The city is an important transport hub situated on the ancient King's Highway and also on the modern Desert Highway. The Vilayet of the Danube or Danubian Vilayet was a first-level administrative division (vilayet) of the Ottoman Empire from 1864 to 1878. In the late 19th century it reportedly had an area of 34,120 square miles (88,400 km2). The Vilayet of Manastir was a first-level administrative division (vilayet) of the Ottoman Empire, created in 1874, dissolved in 1877 and re-established in 1879. The vilayet was occupied during the First Balkan War in 1912 and divided between the Kingdom of Greece and the Kingdom of Serbia, with some parts later becoming part of the newly established Principality of Albania. In the Ottoman Empire, a mutasarrıf was an administrative authority of any of certain sanjaks, who were appointed directly by the Sultan. The State of Damascus was one of the six states established by the French General Henri Gouraud in the French Mandate of Syria which followed the San Remo conference and the defeat of King Faisal's short-lived monarchy in Syria. The Vilayet of Mamuret-ul-Aziz, also referred to as Harput Vilayet was a first-level administrative division (vilayet) of the Ottoman Empire in the late 19th and early 20th centuries. It was also one of the Six vilayets. The vilayet was located between Euphrates and Murat river valleys. To the northwest was Sivas Vilayet. The Vilayet of Aleppo was a first-level administrative division (vilayet) of the Ottoman Empire, centered on the city of Aleppo. The Vilayet of Beirut was a first-level administrative division (vilayet) of the Ottoman Empire. It was established from the coastal areas of the Syria Vilayet in 1888 as a recognition of the new-found importance of its then-booming capital, Beirut, which had experienced remarkable growth in the previous years — by 1907, Beirut handled 11 percent of the Ottoman Empire's international trade. It stretched from just north of Jaffa to the port city of Latakia. It was bounded by the Syria Vilayet to the east, the Aleppo Vilayet to the north, the autonomous Mutasarrifate of Jerusalem to the south and the Mediterranean Sea to the west. The Sanjak of Zor was a sanjak of the Ottoman Empire. Some of its area was separated from the Baghdad Vilayet, when it was created in 1857. Zor was sometimes mentioned as being part of the Aleppo Vilayet, or of the Syria Vilayet. Damascus Eyalet was an eyalet of the Ottoman Empire. Its reported area in the 19th century was 51,900 square kilometres (20,020 sq mi). It became an eyalet after the Ottomans conquered it from the Mamluks in 1516. Janbirdi al-Ghazali, a Mamluk traitor, was made the first beylerbey of Damascus. The Damascus Eyalet was one of the first Ottoman provinces to become a vilayet after an administrative reform in 1865, and by 1867 it had been reformed into the Syria Vilayet. The Mutasarrifate of Jerusalem, also known as the Sanjak of Jerusalem, was an Ottoman district with special administrative status established in 1872. The district encompassed Jerusalem as well as Bethlehem, Hebron, Jaffa, Gaza and Beersheba. 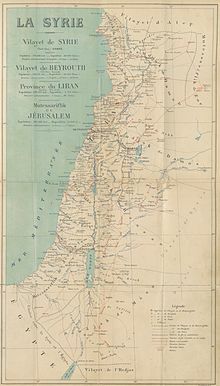 During the late Ottoman period, the Mutasarrifate of Jerusalem, together with the Sanjak of Nablus and Sanjak of Akka (Acre), formed the region that was commonly referred to as "Southern Syria" or "Palestine". It was the 7th most heavily populated region of the Ottoman Empire's 36 provinces. 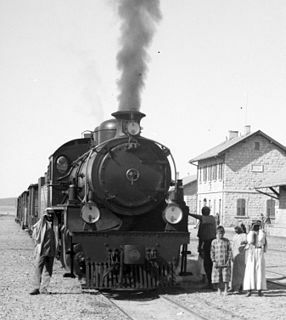 The Mutasarrifate of Karak, also known as the Sanjak of Karak, was an Ottoman district with special administrative status established in 1895, located in modern-day Jordan. The city of Karak was the district's capital. It had a population of 72,562 in 1914. Mehmed Rashid Pasha, also spelled Muhammad Rashid Pasha, was an Ottoman statesman who served as governor of Syria Vilayet in 1866–1871 and as minister of foreign affairs of the Ottoman government in 1873–1874 and 1875 until his death. Rashid Pasha was raised in Egypt where his father was an aide of the governor Muhammad Ali and was educated in Paris before joining government service in Istanbul in 1851. There he became a protege of the grand vizier Ali Pasha, a key figure in the empire-wide Tanzimat reforms. After the latter was reappointed grand vizier in 1866, Rashid Pasha was appointed governor of the Damascus-centered Syria Vilayet which extended from Tripoli and Hama in the north to Palestine and Transjordan in the south. The Damascus Sanjak was a prefecture (sanjak) of the Ottoman Empire, located in modern-day Syria and Lebanon. The city of Damascus was the Sanjak's capital. It had a population of 443,257 in 1914.